Natural immunity support, defend yourself from illness! IdealRaw Defense is an all-natural immunity support supplement made up of a powerful blend of herbs, mushrooms, antioxidants, and probiotics that help your body fight off pathogens so that you can stay healthy! IdealRaw Defense Is For You! Everyday we come into contact with germs and viruses which constantly puts us at risk of getting sick. Stress, lack of sleep, poor nutrition, and dehydration can weaken our immune system. IdealRaw wants you to beat all the illnesses of every season so we have designed an ALL-NATURAL immunity-defense supplement. Each ingredient was specifically chosen for a targeted purpose so that you are protected from all angles! Save on IdealRaw Defense Today! Can I View IdealRaw Defense's Nutrition Facts? 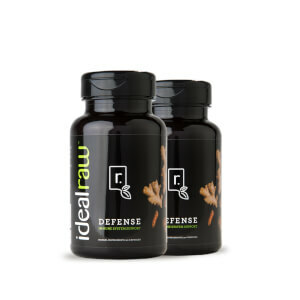 How does IdealRaw Defense Help My Immune System? 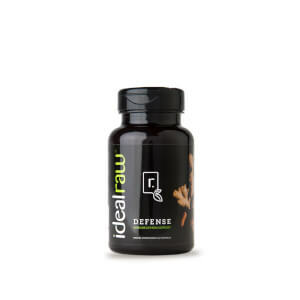 IdealRaw Defense protects and strengthens your immune system in more ways than one. Each ingredient has a specific and unique purpose. The probiotics give you a healthy gut which is essential for a strong immune system. The antioxidants protect your cells from damage. The adaptogens aid in your body’s ability to handle stress. Beta-glucans and vitamins boost the natural immune response. All of these natural ingredients work together to keep you feeling your best. Why can't I just take Vitamin C? Vitamin C is a great antioxidant but it’s limited in how it can help your immune system. Your immune system is extremely complicated and needs protection in more than one way. IdealRaw Defense gives you more than just vitamin C so your immune system can do it’s job. I only get sick during the winter season. Why should I take IdealRaw Defense Year Round? immune systems. IdealRaw Defense keeps your immune response strong so you can feel your best all season long. 3 capsules. There are 30 servings per bottle. When is the best time to take IdealRaw Defense? It can be taken any time during the day, but we advise taking it in the morning for a full day of immune support. Make sure to take with food if possible. Life keeps me pretty busy. As well as helping clients with their nutrition, I have four kids and a husband to care for. Getting sick is a huge set back for me which is why I like to rely on these immune system supplements for a little extra help for my immunity. 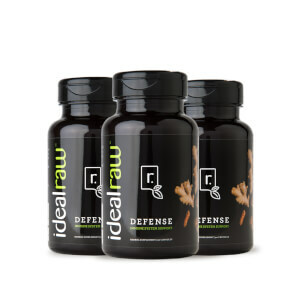 IdealRaw Defense gives my body the protection it needs by strengthening my immune system in multiple ways. It provides probiotics for a healthy gut, antioxidants for cell health, adaptogens for stress, vitamins, and much more. I take it daily year round so I can always feel my best!